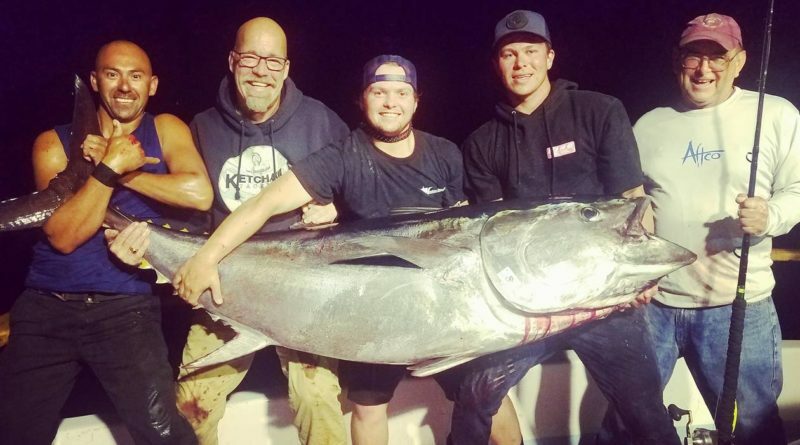 SAN DIEGO — Southern California offshore anglers have been looking at a lot of fish in local offshore waters during the early part of the summer fishing season. They are often frustrated, however, by it being very difficult to get the fish they were looking at to bite. There is still a lot of that going on, but the past week of fishing has seen better numbers of fish doing more than just showing and are more readily willing to bite. Anglers have a wide variety of species to target in offshore waters with bluefin tuna, yellowfin tuna, Dorado, yellowtail and striped marlin biting. In addition there are some super exotic species around with blue marlin and wahoo in the picture as well. With regard to the super exotic blue marlin and wahoo, there was a confirmed blue marlin hookup last week on a fish estimated to be more than 400 pounds and bit on a jig at the 224 Spot. The big blue marlin was lost when it spooled a 50 wide size reel loaded with 135-pound test braid. Wahoo have also been seen under lights at night by a drifting sportboat. There have been a series of mystery clip offs on trolling gear that can best be explained by a wahoo strike and private boater. Capt. Bob Woodard Jr. of Dropback reported seeing two wahoo as clear as can be while diving next to a kelp paddie at the 302 Spot. The best area for bluefin tuna is out at San Clemente Island, where there has been action on jumbo-sized fish at 250+ pounds. 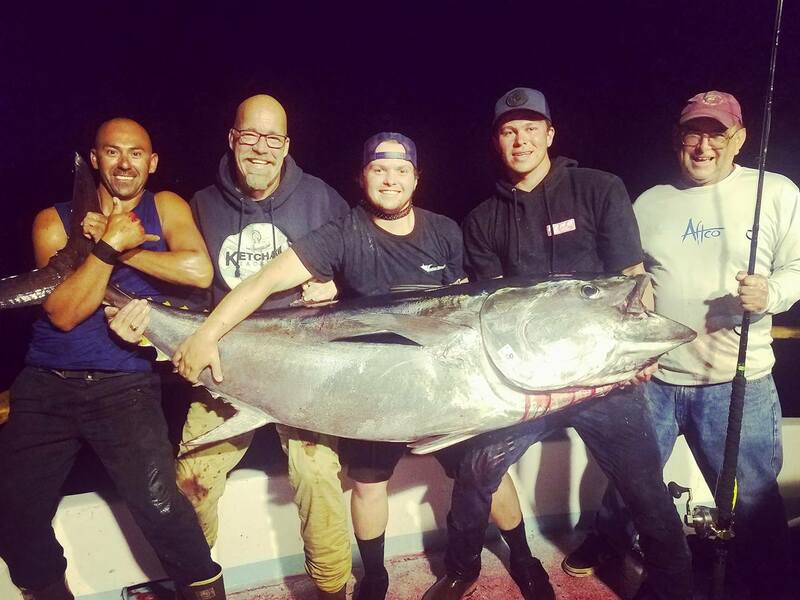 The bluefin have been showing in various areas around San Clemente Island with the best action coming from outside of China Point while fishing around Desperation Reef, the 81 Fathom Spot and the 86 Fathom Spot. There were also showings of bluefin along the ridge area of the San Clemente Canyon off Pyramid Head as well as while fishing 2 to 4 miles inside of the Island between Pyramid Head and the Radar Dome. The bluefin have been biting on a variety of baits and lures such as sardines, mackerel, live squid, flying fish, kite trolled Yummy Flyers, Flat Fall jigs and poppers. The bluefin have been found by locating meter marks, sonar marks and spots of fish working on the surface. Some of the best fishing sometimes happens during the dark with the few hours after sunset and prior to dawn being the best. In other areas, the fishing for a mix of yellowtail, Dorado, yellowfin tuna and mixed size bluefin tuna has been improving and at times has been providing good action. The yellowfin tuna have been mostly 8- to 12-pound fish, with some bigger fish to 50 pounds also reported. Most of the bluefin tuna in these areas have been the 15- to 20-pound fish, with a few bigger fish to 250+ pounds also reported. The Dorado and yellowtail have been running from 6 to 25 pounds. Areas around the east end of Catalina have been the best for striped marlin. On Aug. 5 a boat had a triple while fishing outside of the Rock Quarry. They were able to catch and release all three fish. The fishing at Los Coronado Islands continues to provide good action for a mixed bag of yellowtail, barracuda, bonito and calico bass. There have also been a few bluefin tuna around and biting. Productive areas have been Pukey Point, the Middle Grounds, the north end of South Island, the lighthouse at the south tip of South Island, the 5 Minute Kelp and the Ribbon Kelp. Mission Belle out of Point Loma Sportfishing had a full-day trip with 36 anglers catch 41 yellowtails, 22 calico bass and six bonito. Seaforth Sportfishing had a full-day trip aboard Sea Watch fishing with 32 anglers who caught 74 yellowtails, 26 calico bass, 11 bonito and eight barracuda. The yellowtails have been biting from slow trolled and drifted mackerel and sardines. Surface iron and trolled X-Rap Rapalas have also been effective for yellowtail. Locate yellowtail by finding meter marks, sonar marks and spots of working birds. Yellowtail have also been located by getting trolling strikes on X-Rap Rapalas, slow trolled sardines and slow trolled mackerel. The fishing along the San Diego County coast remains pretty much the same at it has been in recent weeks and has been providing good fishing for a mix of calico bass, sand bass, rockfish and sculpin. Boats fishing the edges of the Point Loma Kelp Beds and fishing outside of the Point Loma kelp beds in the 30 to 40 fathom depths have also been picking up a few barracuda and an occasional yellowtail. The most productive kelp bed spots along the San Diego County coast for calico bass have been the Point Loma Kelp Beds, the upper end of La Jolla, Del Mar, Solana Beach, Leucadia, Carlsbad, the Barn Kelp, Box Canyon and San Onofre. The summer fishing season is in full swing and the fishing looks like it is still improving. Anglers have their choice of a lot of fun fish to target be it offshore, at the Islands or along the coast. Make sure you get out there and take part in the action. Keep on fishing and I hope to see you out on the water!